Home / Reviews / Arrow: The Complete Fourth Season Blu-ray Review! Arrow: The Complete Fourth Season Blu-ray Review! Warner Bros Home Entertainment provided me with a free copy for the Blu-ray I reviewed in this blog post. The opinions I share are my own. It seems like The CW has become the network of DC Superheroes, there’s The Flash, Legends of Tomorrow and now Supergirl is joining the mix. The series that started it all however, is Arrow. 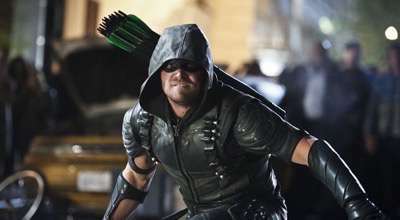 The series starring Stephen Amell as the Hood ushered in a new generation of superheroes on television. I know a lot of people say that Arrow has run its course, but I think the series has lot’s of life left in it. 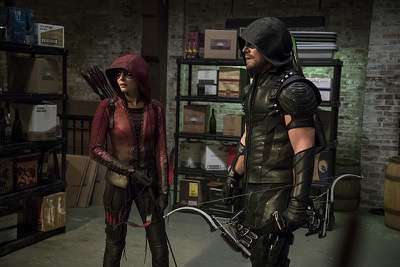 Arrow: The Complete Fourth Season is out now on Blu-ray and when we last saw Oliver Queen (Stephen Amell) and Felicity (Emily Bett Rickards) they left Star City hoping for a new start. However, as we all know Oliver can’t leave his past behind. The rest of Team Arrow are trying to keep the city on track but are not having the easiest time in doing so. As much as season four of Arrow is about another big bad attacking the city, it’s also about Oliver and Felicity and their life together. Trying to make it work, and keeping their identities (not the secret kind) while being part of a couple. It’s something every couple goes through only on Arrow it also includes masks and cyber hacking. Felicity is running Queen Consolidated as the CEO and Olivier is running for Mayor of Star City. Both subplots are great for the actors and the characters and give them so much to work with. 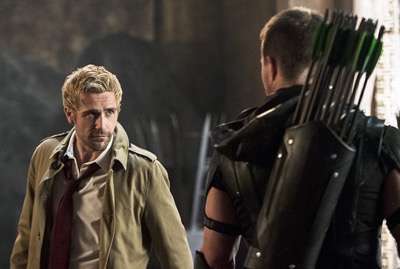 In the beginning of the season, a lot of time was spent ramping up Legends of Tomorrow and putting those characters back in play in the Arrow-Verse. 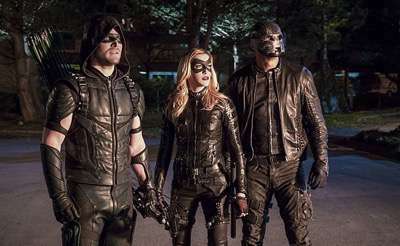 I wish there wasn’t so much time spent on spin-off as it really shortened the time that Thea (Willa Holland) and Diggle (David Ramsey) got to shine. One noticeable thing about Arrow this season, is that it feels less dark than the past three seasons. There’s a touch more humor added to the mix, which probably has something to do with sister series The Flash, Legends of Tomorrow and Supergirl being way more light and frothy. It’s not a laugh riot by any means, this is still Arrow after all, but viewers can really sense the impact of the other shows over the course of the season. The new villain this season comes in the form of Damien Darhk (Neal McDonough). He’s got his eyes on controlling Star City even his plans may be a little vague at best. He and Malcom Merlyn (John Barrowman) provide the catalyst for most of the action this season. Malcolm of course playing with team Arrow, and then betraying Team Arrow and then getting back with Team Arrow is a delight. I have to tell you, I was never a fan of John Barrowman until his turn on Arrow. He just has that spark in his eye when he’s going to do something dastardly and he’s so fun to watch. Season four is when a lot of shows really allow the actors to sink into their roles and the same is true here. Emily Bett Richards is so good as Felicity, she just makes you fall in love with the character and she really humanizes Oliver in and out of the Arrow suit. She’s given him a reason to do all the good he’s trying to do and this season I think even more than before it’s really prevalent. Arrow: The Complete Fourth Season arrives on Blu-ray in a fine transfer from Warner Bros. Home Video. I’ve said this before, but the picture quality on the Blu-ray releases from Warner Bros. Home Video are leaps and bounds better than the broadcast version. Here the mood and intensity are enhanced by the crystal clear picture. It really makes the series seem more cinematic and there is very little loss even in the action scenes. Details are exquisite throughout and the colors are deep and rich. 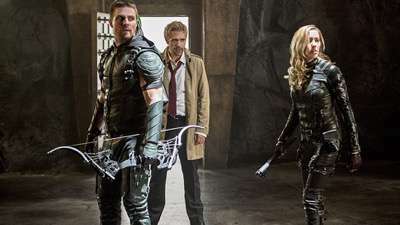 Star Crossed Hawks – This is a look at Hackman, Hawkgirl and Vandal Savage who eventually head to Legends of Tomorrow. It’s worth a look as it goes into detail about how they fit into the universe and even looks at the special effects that go into creating the characters. Star Crossed Hawks: The Hunt For Vandal Savage – This is a quick look that is the companion piece to the above. It looks at the villain for Legends of Tomorrow, Vandal Savage and his relation to Hawkgirl and Hawkman. Arrow: 2015 Comic-Con Panel – I love that the Warner Bros releases include the SDCC panels. Always work a look. Smooth Criminal: The Damian Dark Story – This is a look at the new big bad this season and his comic book origins. There are also about 10 deleted scenes for select episodes as well as a gag reel. 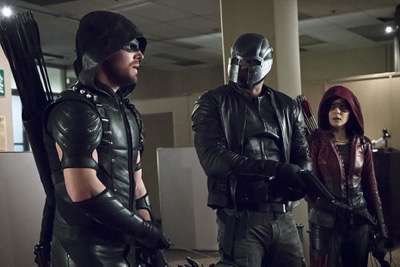 Overall, I don’t think you can go wrong with Arrow. Even when it’s a little wobbly on plot the actors know their roles so intimately by this point that they are a real treat to watch. The series is not lacking for action and it’s impressive that the DC small screen universe has done what the big screen counterpart has failed to do… Create fun and compelling characters and action. Arrow: The Complete Fourth Season is out now on Blu-ray! 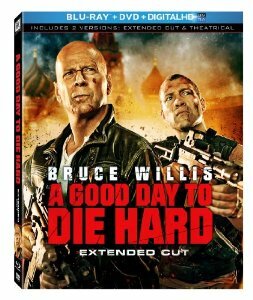 A Good Day To Die Hard Blu-Ray DVD Review! John McClane Is Back And Destroying Russia In The Process! Bruce Willis! Jai Courtney! The Rocky Horror Picture Show 40th Anniversary Edition Blu-ray Review! Does The Cult Classic Still Make You Quiver With Antici… Pation! Britney Spears Femme Fatale Tour Staples Center Los Angeles June 20th 2011 Concert Review With Nicki Minaj! Photos! Scream Queens Season 1 Episode 12 Review And Recap! Dorkus!